Zebrafish could help scientists understand the early stages of diseases such as osteoarthritis after spending time in hypergravity to investigate how their development is affected by increased loading conditions. 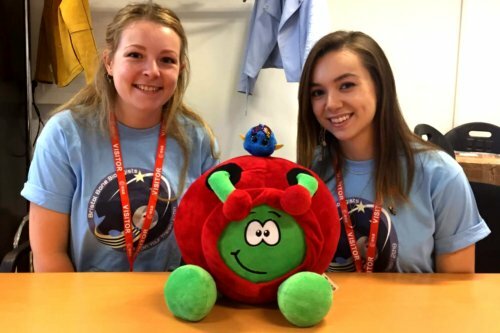 Postgraduate students from the University of Bristol completed their study at the European Space Agency (ESA) European Space Research and Technology Centre last month. The Bristol Bone Biologists, Elizabeth Lawrence, PhD student in Dynamic Molecular Cell Biology, and Jessye Aggleton, PhD student in Anthropology and Archaeology, were one of two teams chosen to run their research with ESA Academy as part of their annual student hypergravity experiment campaign 'Spin Your Thesis!'. The students used a Large Diameter Centrifuge (LDC), which ran for 48 hours, to see whether zebrafish develop normally in altered gravitational fields. The zebrafish larvae have returned to Bristol's Hammond Lab in the School of Physiology, Pharmacology and Neuroscience and the students will now study their joints and immune cells. Elizabeth Lawrence said: "We have used hypergravity to simulate increased mechanical loading during a key time in joint development in zebrafish and will be looking at changes to the shape, structure and function of muscles, cartilage and bone in the larvae to see what impact it has had on their development. "This research will help us understand the importance of mechanical loading and genetics during early life in the onset of diseases such as osteoarthritis." Jessye Aggleton added: "It's been a fantastic opportunity to work with the European Space Agency Education team and those at the LDC. It's a unique project that has enabled our team to pitch, plan, and run a large-scale experiment from scratch. "Collecting exciting data is just one of the great outcomes of the project and we've developed many other management and outreach skills along the way." As well as Bristol-based analyses, the team captured video data at the LDC of the zebrafish larvae swim behaviour and their response to motion and sound vibration. This additional experiment into behaviour was chosen by members of the public who voted in a poll as part of a public engagement event by the Bristol Bone Biologists in August at We The Curious. The 'Spin Your Thesis! 2018' experiment week took place at the Large Diameter Centrifuge (LDC) facility in Noordwijk, the Netherlands from 17-21 September. The team have been preparing a year for the experiment, having previously completed a training week in February for the project. The project can be followed on Facebook, Instagram and Twitter. A paper relating to the project was recently published, with other members of the Hammond Lab, in the journal Philosophical Transactions of the Royal Society B: Biological Sciences. The paper, 'The mechanical impact of col11a2 loss on joints; col11a2 mutant zebrafish show changes to joint development and function, which leads to early-onset osteoarthritis' looked at how a genetic mutation (associated with severe skeletal dysplasias such as Stickler syndrome) affects the skeleton during development. It showed that Type XI collagen is essential for the maintenance of the major collagen in cartilage, and that loss of this leads to stiffer cartilage and bone, along with altered joint shape and spacing in the lower jaw region of young zebrafish. These changes to material properties and morphology impact on the pattern of strain distribution and the function of the jaw joint. The paper also showed that adult fish with this mutation have osteoarthritis-like changes in the jaw joint, indicating that type XI collagen has a key role in the maintenance of cartilage, and therefore joint shape and function, throughout development and in to adulthood, and that loss of this collagen can result in severe skeletal abnormalities. 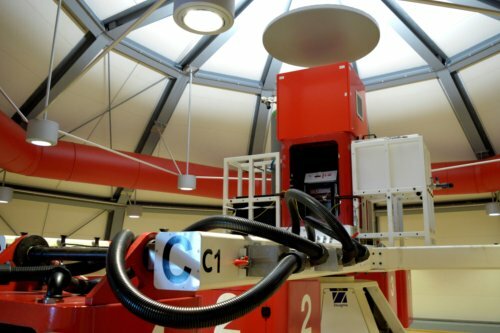 A Large Diameter Centrifuge (LDC) has been developed by ESA allowing the acquisition of measurement points in the range from 1 to 20 g. This instrument can provide a hypergravity environment for cells, plants and small animals, as well as physical science and technological experiments. The LDC is part of the Life and Physical Sciences Instrumentation and Life Support Laboratory (LIS) at ESTEC (the Netherlands), dedicated to serve the science and technology user communities throughout Europe. A wide range of hypergravity experiments can be undertaken in the LDC facility, in particular biology, biochemistry, microbiology, optical physics, material sciences, fluid dynamics, geology and plasma physics investigations can be performed. The diameter of the LDC is eight metres. It has four arms each of which can support two gondolas with a maximum payload of 80 kg per gondola. In practice however, up to six gondolas can be used for an experiment plus one additional gondola in the centre for control or reference purposes.